The Ohio Bobcats will be getting plenty of attention at Doc’s Sports this year. The Bobcats have been selected as the team I’ll be following for my mid-major betting report in 2012. All season I’ll be following Ohio beat writers, Twitter feeds, and press conferences from the football program. By becoming an expert on this program, I want to show the betting world how specialization is a profitable sports betting strategy. At the end of each weekly article, I will make a selection for that weekend’s game. Doc’s Sports Unit Betting System will be used for every pick, which should help readers follow along and track the results of these weekly college football picks. Last year, I followed the Rice Owls in my mid-major betting report. Last year’s results were terrific. At the end of 2011, the selections had finished with a 7-2-1 record and a profit of $1,280. Now, let’s take a closer look at the Ohio Bobcats. The 2011 season saw the Ohio Bobcats get their first bowl game win in the team’s history. Ohio edged Utah State, 24-23, in the Idaho Potato Bowl. The team finished with an impressive 10-4 record. Still, not everything about the season went just the way the team had hoped. The MAC Championship Game was a major missed opportunity for the Bobcats in 2011. Ohio jumped out to a 20-0 halftime lead over Northern Illinois. The Bobcats offense stumbled in the second half, and Northern Illinois kicked a field goal as time expired to win, 23-20. Ohio has now been in the MAC Championship Game three times in the past six years, but they have yet to win the title. This year’s team is highly motivated to capture that first MAC Championship. Frank Solich is the head man at Ohio University. Many likely remember him from his days coaching at Nebraska. Solich went 58-19 at Nebraska, but the Cornhuskers faithful wanted more. He moved on to Ohio, where he has done a brilliant job turning the Bobcats program around. Ohio is 50-40 in his tenure with the school, and the team has been to four bowl games during that period. Solich is known as an offensive innovator who stays a step ahead of other coaches. Ohio decided to go up-tempo with their offense in 2011. The Bobcats utilized a no-huddle offense with star quarterback Tyler Tettleton at the helm. Tettleton quickly became one of the best dual-threat quarterbacks in the country. He racked up 3,302 yards and 28 passing touchdowns. In addition, he ran for 658 yards and 10 touchdowns. Tettleton finished 20th in the nation in total yards in 2011. He will be the leader of this offense again in 2012. Unfortunately for Ohio, Tettleton won’t have as many weapons around him this season. Deonte Harden was a third-team all-MAC running back, but he graduated. Beau Blankenship and Ryan Boykin should be a solid pair in the backfield. The bigger issue is likely at the wide receiver position. LaVon Brazill and Riley Dunlop had record-breaking seasons for the Bobcats at wideout last year, but both were fifth-year seniors. Donte Foster is the only remaining starter at split end. The Bobcats will have to find some more playmakers on the outside. One of the main reasons Ohio was so successful in 2011 was the Bobcats dominating offensive line. They lose right tackle Joe Flading and left tackle A.J. Strum. Both of these guys were stars, but Solich is confident about the Bobcats offensive line entering this season. John Prior and Ryan McGrath both look like guys who could step in and be highly effective immediately. The Bobcats return six starters on this side of the ball, but one of their losses was star middle linebacker Noah Keller. He piled up 438 tackles and eight forced fumbles in his career with the Bobcats. The coaching staff is counting on a group of players to pick up the slack and become leaders in the absence of Keller. Keith Moore, who finished second on the team in tackles in 2011, will likely inherit the middle linebacker spot. Overall, the linebackers have more question marks than the other defensive units. The defensive front is extremely deep, which allows them to substitute often and stay fresh. Carl Jones, Neal Hunyh, and Corey Hasting are all great defensive tackles who can clog up the running lanes. On the outside, Tremayne Scott shared the team lead for tackles for loss and sacks last season. His athleticism makes him very difficult for tackles to stay in front of when he rushes around the outside. Expect the secondary to be the strength of this defense. In seniors Travis Carrie and Gerald Moore, the team has two leaders at the back of the defense. Carrie had four interceptions last year, and he is one of the best athletes in the conference. Moore has started since his freshman season, and some see the NFL in his future. Solich has recruited well in the secondary, and there are plenty of young and talented players ready to step in if needed. The season opener at Penn State looked like a brutal game a year ago, but now it’s hard to tell what Penn State will look like on the field this season. Still, it will be a good test for the Bobcats to see if they are ready for the big stage. The rest of the nonconference slate looks relatively easy. Inside the MAC, the schedule will get tougher for the team as the season moves along. Miami (Ohio) is never easy to beat on the road, and the season finale at Kent State will be a very tough test. Can the Bobcats finally get over the hump and win the MAC Championship? BetOnline lists Ohio as the favorites to win the MAC Championship in 2012. The Bobcats are priced at +275 to win the conference. 5Dimes lists Ohio at +120 to win the MAC East Division. 5Dimes puts the Bobcats season win total at 9.5 games (the ‘under’ is a small favorite at -130). Ohio should have another highly successful season in 2012. Solich has done a great job building this program over the last few years. The schedule isn’t terribly difficult, which makes double-digit wins fairly likely. Ohio has to replace some key players from a year ago, but they still have plenty of depth and lots of potential. If you are looking for a value play, I suggest playing the Bobcats to win the MAC East. It’s hard to imagine another team overtaking the Bobcats in this division. 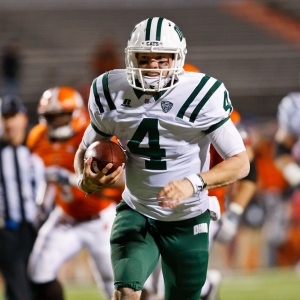 Be sure to follow along this season with the mid-major betting report, which will follow the Ohio Bobcats every step of the way. I’ll provide a free betting pick on each game, and take an in-depth look at a program that is slightly off the radar of most sports bettors.